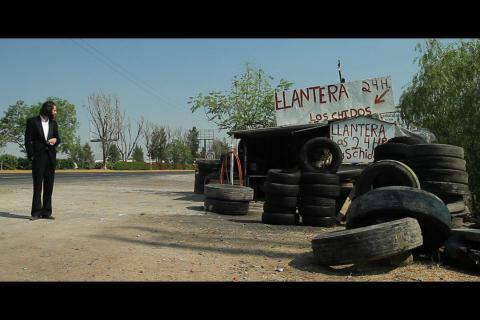 Set amid the noisy outskirts of some unnamed Mexican metropolis, "Los Chidos" tells the story of the Gonzales Family. Proprietors of a tire repair junkyard sandwiched between two busy freeways, the Gonzales clan's days are spent wallowing in lazy, mindless routine. When a confused American industrialist happens into the shop with a flat tire, the family's place in the shame-free food chain is called into question. A scenario unfolds whereby the pale stranger finds himself welcomed into their fold. He is soon infatuated with the newlywed bride of the family's neighbor. As a love blossoms, dark secrets begin emerging. Omar Rodriguez Lopez is an intensely prolific Grammy-winning artist whose genre-defying career has resulted in over 40 albums. In the early 2000s, Rodriguez Lopez began filmmaking. His debut, 2009's "The Sentimental Engine Slayer" premiered at International Film Festival Rotterdam, and Tribeca Film Festival, screening at over 20 film festivals worldwide.